Complimentary to attend for CISOs and similar senior cybersecurity professionals working in-house for non-vendor, non-consultancy organisations, this is a unique opportunity to connect with peers and expand your trusted professional networks to strengthen capacity. 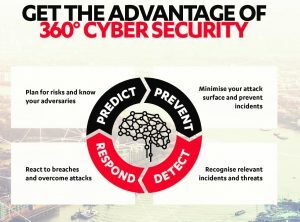 A multi-faceted ‘360’ benchmarking exercise for CISOs to exchange experiences on what works, what doesn’t, priorities and challenges around managing cybersecurity threats and breaches. Understanding the threat landscape. How to focus on those threats that are relevant to our organisation? Is it possible to be predictive in information security? Making best use of available resources. How to justify what security improvements to focus on? How do we quantify the cost of potential breaches to fund a sustainable cybersecurity programme? Combating the most common sources of compromise – insider threats and Internet exploits. What are the potential weaknesses in modern organisations that adversaries try to exploit? Are there ways of organising and deploying enterprise systems which reduce impact and reduce time to recover? Do you have visibility beyond the preventive layer? Or the human factor in case of mistakes and unexpected behaviour? How do targeted attacks usually happen? How do you build effective breach detection and response capabilities against advanced targeted attacks? How do you prepare for the inevitable security incident? How do you select the necessary tools, methods and practices to enable seamless response capability across the organisation? How do you respond to incidents in a way that limits damage and reduce recovery time and costs? • What is the scope, source, magnitude and management response • What data and information should be collected • Who is on the crisis team • At what stage should customers be informed? threat landscape to consider. Attendees will be asked to select 2 out of the possible 4 Roundtables when they register. The CISO audience will rotate their choice of tables once. The two Co-facilitators and a note-taker will remain fixed to each table to lead and capture the key discussion points, observing The Chatham House Rule. Notes will be taken throughout the roundtable discussions, observing the Chatham House Rule. 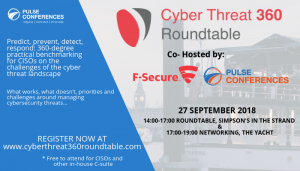 Once all the feedback has been compiled and written up, the end-result will form the ‘Cyber threat 360 output report’, a report that will be distributed to all attendees in the weeks following the event with the combined thoughts and conclusions from the participating leading companies. *Please note that registration for this particular event is only open to CISOs and similar senior cybersecurity practitioners currently working in-house for corporates (financial services, energy, utilities, gaming/gambling…). All online registrations are subject to final approval by Pulse Conferences.